Full description on the QRP Labs VFO kit page. The Si5351A VFO/Signal Generator kit provides two independent output freqeuncies, 3.3V peak-peak squarewave and in the range 3.5kHz to 200MHz (Si5351A datasheet spec). An extended range up to 292MHz has been experimentally measured. One output is variable and rotary encoder tuned, the other is fixed (configurable frequency). The kits are easy to build, with through-hole components only (no surface mount soldering - the Si5351A chip is pre-soldered at the factory). Printed instructions are not supplied with the kit! Please see the VFO/Signal Generator web page to download the kit instructions, and for further information. Click here! NOTE regarding the OCXO option: The VFO/Signal Generator kit INCLUDES the standard Si5351A module kit. Optionally you can also purchase the OCXO/Si5351A module kit, which is plug-in compatible with the VFO/Signal Generator. The OCXO/Si5351A kit has high frequency stability. However, the OCXO/Si5351A kit is more difficult to build and adjust than the other kits. If you want to build the OCXO kit, we recommend that you build the standard Si5351A kit first, and get everything working, THEN build the OCXO/Si5351A kit. In general the standard Si5351A module kit is good enough, particularly if you are using a GPS for frequency calibration and drift correction. You would only need the OCXO/Si5351A module kit if you want to operate in an environment with wildly changing temperatures, or you do not want to use GPS for drift correction, or if you have some particular requirement for extreme freuqency stability, or if you are a perfectionist or just want the challenge and interesting OCXO kit! NOTE regarding the GPS option: Connecting a GPS like the QRP Labs QLG1 kit is a very nice and inexpensive addition to the VFO/Signal Generator kit. The GPS provides the initial frequency calibration as well as regular drift correction. 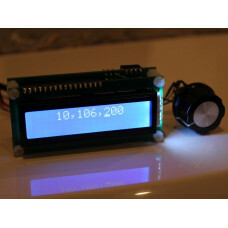 A drilled, cut, silk-screen printed enclosure is available (click checkbox above when ordering), with an accessories kit containing connectors, buttons/switches, and mounting hardware. See the VFO/SigGen case page for details.